Dreams do come true! Galleria Ca’ Do’Oro will be hosting “Movie’n’Food – Taste of Cinema” on June 25th. This special event blends cinema and food, giving guests an unmatched experience of the eye and mouth. 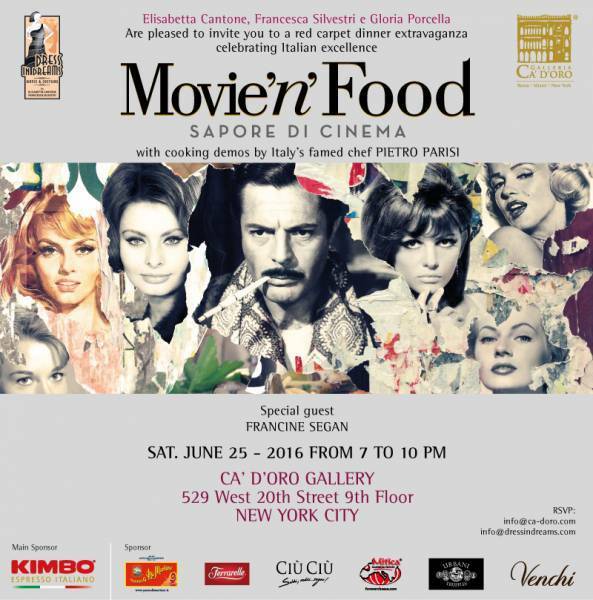 Celebrating the best of Italian food the day before the Fancy Food Show of New York City, Movie’n’Food – Taste of Cinema takes guests on a journey through cinema, taste, and gastronomy, curated by Dress in Dreams of Elizabetta Cantone and Frencesca Silvestri. The night will present the most beautiful and significant images of films where food is the protagonist. Eight-minute video clips from cult films Ratatouille, The President’s Chef, Madame Mallory and the smell of curry, Eat Pray Love, Pretty Woman, The Gold of Naples, Lady and the Tramp, The Leopard and Big Night will be shown. Guests will also experience the amazing cooking of Chef Peter Parisi, the self-described “peasant chef” who grew up around famous chefs Alan Ducasse and Gualtiero Marchesi. The internationally known chef is known for never wasting; using everything in the kitchen, including stems, skins, and even leaves. In addition to describing some of his most famous recipes, Parisi will prepare dishes dedicated to films and international stars. He will prepare chocolate gnocchetti, drawing from the film Chocolat; coffee and ricotta pasta, a nod to Marcello Mastroianni; risotto with black truffles, inspired by The President’s Chef; Neapolitan pizelle for Sophia Loren; and much more for the event. The event will also welcome an expert in Italian culinary culture and tradition, a specialist of New York City restaurants, and Ms. Francine Segan, a judge from the Fancy Food Show. Many esteemed guests will be at the event, including Tony May, founder of the famous San Domenico of Manhattan, cinema and food journalists, and buyers from the Fancy Food Show. Kimbo coffee, the main sponsor of the event, will tell their Italian story of their growth from the traditional Neapolitan “cuccuma” to the new ecofriendly, organic blend coffee pods that can be found in most coffee machines. Ferrarelle, the Italian water that is exported around the world, will serve Ferrarelle-Mojito cocktails and limited edition platinum bottles bearing the logo of the event. Società Agricola CIU’ CIU’ of Offida, will also supply exquisite white and red wines. Gragnano DOC pasta, bearing the name Di Martino, created the “Il Primo Manhattan” competition, a challenge that had 200 Italian chefs in New York City contending for the title of best in New York City. The final will be held on June 24th at Ribalta, the popular Italian restaurant owned by Neapolitan entrepreneur Rosario Procino and Chef Pasquale Cozzolino. The winner will be announced at Movie’n’Food. Movie’n’Food –Taste of Cinema has traveled around North America, touring in San Francisco, Los Angeles, Houston, Chicago, Toronto, and now New York City. The next stop on the continental tour will be Miami in October.